It is the home of the sport of horse racing in the USA, but a light has been shone on Kentucky’s poor animal welfare record, revealing its ranking of last of all 50 states for animal safety. Animal abuse and neglect in the bluegrass state is not a felony — it’s a misdemeanor. But a Kentucky-based group is working to change that and make the state a better place for horses. Members of the Kentucky Equine Networking Association (KENA), part of the Kentucky Horse Council, have spoken of unintentional equine neglect and abuse and the need to increase understanding in the prosecution process in the state. These challenges were highlighted at KENA’s November meeting, and speakers included Lt. Jai Hamilton, a certified Humane Investigator with Lexington-Fayette Animal Care and Control. Hamilton explained that in Lexington, there are 11 animal control officers for a city with 321,000 residents, and about 1600 welfare cases reported each year. She said most animal cruelty complaints her department receives arise from unintentional neglect, and as a result, her department has two goals: To educate clients and to raise the animal’s standard of care. But a major challenge was that Kentucky lacks laws to punish animal abuse and neglect. This is part of the of the reason why many animal abuse cases never go to court, said Jacque Mayer, Assistant County Attorney for the Fayette County Attorney’s Office. The pretrial is extensive, she noted, as it can take a long time to contact witnesses and obtain photos and testimony in a neglect case. But she noted that though these cases are more complex, they are easier to prove: Lawyers do not have to prove that the defendant had intent to harm the animals — simply that he or she harmed them. The maximum fine for someone found guilty of animal neglect in Kentucky is 365 days imprisonment per animal (terms that can run concurrently) and a $500 per-animal fine. 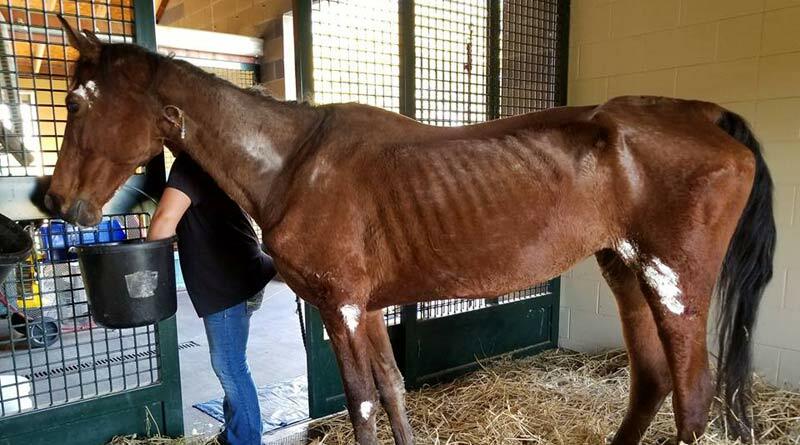 Karen Gustin, Executive Director of the Kentucky Equine Humane Center in Nicholasville, said difficult cases can cost between $5000 and $10,000 for emergency care and subsequent treatment. Challenges faced by the center include a lack of knowledge about who to contact when abuse and neglect occurs; a lack of responsiveness from appropriate agencies because of limited resources and facilities, and cost. While animal abuse is considered “low priority” compared to other crimes, if you see a horse you feel is being neglected (intentionally or not), report it. If you don’t know who to contact, start somewhere — eventually you will be connected to the correct organization or person. If you feel nothing is being done and the animal is deteriorating, continue contacting the agencies responsible for investigating. Take photos of the horses, over time, and document what you see. Be willing to go on record with a statement about the horse’s care or lack thereof. As a farm owner or horse lover, consider locating an organization that helps with equine neglect and abuse cases and find out how you can help. Help can range from financial donations, housing and care of surrendered horses, or assistance with training officers unfamiliar with horses. I sold a horse to a certain farm in Ky to find out she not being cared for properly horse is thin I will be retrieving very her soon!! I sure hope there’s a special place in hell for those who don’t care for their animals..
KY ranks 50th in animal welfare laws in the USA. This is a disgrace. The SAFE Act, H.R.113/S.1706 needs to be passed to stop the shipment of horses to slaughter. Animals’ Angels has documented the cruelty of horse slaughter.